Even though it has been almost two months since TL and I returned home from our trip, I am loving looking through the pictures and reliving our time in Europe. One of our favorite Countries is Germany. We really enjoy the food, beer, and culture. It's also a Country that is jam-packed with history. Obviously, it's not a great history, but it's an important one. Berlin was nearly destroyed during the World War 2. Driving around the city, it is easy to see parts of the city that are still broken. There were bullet holes on the exteriors of some building, half destroyed statues, and museums everywhere you turn. It's a city that has come through a lot, even since the Berlin Wall. If you have any interest in History... this place is full of it. We learned so much while we were there. It's truly amazing to see this (The Brandenburg Gate). This gate has seen so much... it was eerie to see postcards with the Nazi Party marching beneath it and then minutes later walk freely under it. The biggest and most expensive central train station in Europe... it cost almost 1 Billion Euro to build! The city tour bus we took! We ate here twice... the food was traditional German and it was delicious! A truly beautiful city... we loved Berlin. We did a lot in the 5 days we were there!! We stayed at the Westin Berlin and it was in fairly close walking distance to a lot of great parts of the city. If you go, I recommend staying there. Can't wait to share more. That would be amazing to go there! Great pictures! I've always wanted to visit Germany. And I think those buses are the best way to see a city! We do them all of the time. 1. I love the picture of TL posing like a statue haha. 3. I always enjoy looking at pictures of places you have traveled, at least one of us is cool! That pretzel is HUGE!!! I am totally loving your photos of Berlin! It makes me want to plan a vacation! Wow, such a cool place to visit! wow! SO interesting. I get super emotional when I hear things like, "There were bullet holes on the exteriors of some building, half destroyed statues, and museums everywhere you turn." It breaks my heart because world war 2 was a part of history that I paid so much attention too. I don't have any German or Jewish relatives, but it kills me to know that such events took place. Definitely proud to be an American and so proud of our soliders who went over there to make things right. ... end rant! These pictures are extraordinary! I really hope to visit myself one day. I would even love to take our children. Pics are gorgeous, and the food looks delish! Oh my goodness, I CAN NOT WAIT to see your Berlin photos! When we were in Europe this summer we only had about 36 hours there, but it was incredible. You're right, there is so much history! For a history/architecture lover like me, it was a fascinating city. I'd love to go back again in 20 years or so and see how different it is. How fun! This looks like such a great trip and of course that food looks delish! I couldn't find your email on your page but I wanted to let you know that I have you as my partner for the ornament swap! So I'll be sending you a new Christmas ornament :) When you get a sec will you email me back with any preferences as well as your mailing address? Thanks! definitely on my list. i honestly never thought i would say this about a sausage... but oh my gosh that looks soooo good!! What beautiful pictures! I am sure you learned SO much visiting the city! 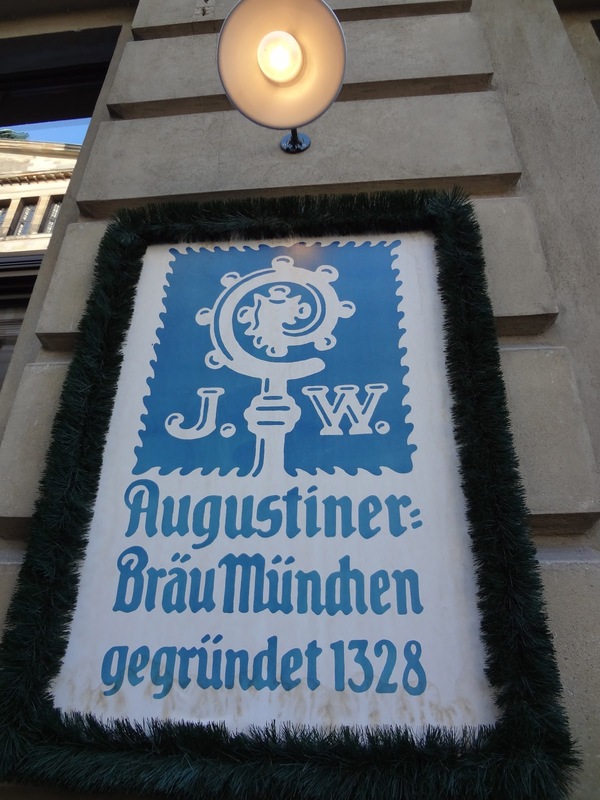 We went to the Augestiner in Munich and Salzburg - loved it! We actually brought back a stein from there! I wish we could have made it up to Berlin, your pictures are fantastic! Next trip! p.s. what/where is next on the list for you guys? City bus tours are the best! We did one when we went to Sydney and it was my favorite part of the trip. I'm glad you're back to your trip! i love it. and although i feel oh so touristy when taking the hop-on-hop-off buses, they are the best way to see any city. How exciting! Great pictures! A bus tour sounds like a great idea for sightseeing! I always love your trip recaps! :) Germany is on our list, so hopefully we will visit someday soon. I want to go!! You guys travel to some of the most amazing places!